Lineage. Constituted 341st Fighter Squadron on 24 Sep 1942. Activated on 30 Sep 1942. Inactivated on 10 May 1946. Redesignated 141st Fighter Squadron, and allotted to ANG, on 24 May 1946. 141st Fighter Squadron (SE) extended federal recognition on 26 May 1949. Redesignated: 141st Fighter-Bomber Squadron on 1 Mar 1951; 141st Fighter-Interceptor Squadron in Jul 1955; 141st Tactical Fighter Squadron in Nov 1958; 141st Air Refueling Squadron on 19 Oct 1991-. Assignments. 348th Fighter Group, 30 Sep 1942-10 May 1946. 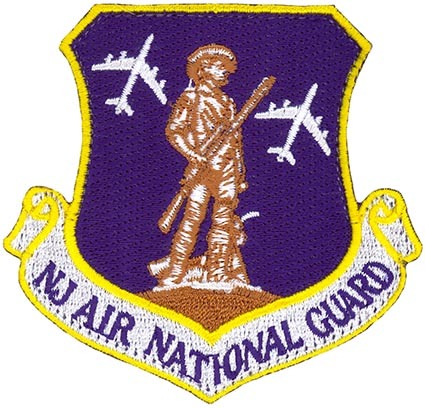 NJANG, 26 May 1949; Tactical Air Command, 1 Jul 1960; 108th Tactical Fighter Group, 15 Oct 1962; 108th Tactical Fighter Wing, 9 Dec 1974; 108th Air Refueling Wing, 19 Oct 1991-. Aircraft. P-47, 1942-1945; P-51, 1945-1946. F-47D, 1949-1952; F-51D, 1952-1954; F-86A, 1954-1956; F-86E, 1956-1958; F-84F, 1958- 1962; F-86H, 1962-1964; F-105B, 1964-1981; F-4D, 1981-1985; F-4E, 1985-1991; KC-135E, 1991-2007; KC-135R, 2007-. Operations. Combat in Southwest and Western Pacific, 29 Jul 1943-15 Aug 1945. Ordered to active duty as part of the Korean War call-up, 1 Mar 1951-1 Dec 1952. Called to active duty as a result of the Berlin Crisis, 1 Oct 1961-17 Aug 1962. Worldwide aerial refueling, 1991-. Participated in Operation: RESTORE HOPE, 1992; DENY FLIGHT, 1994; SEA SIGNAL, 1995. 170th Air Refueling Group consolidated with the 108th Air Refueling Wing, 1 Oct 1993. Campaigns. Air Offensive, Japan; China Defensive; New Guinea; Bismarck Archipelago; Western Pacific; Leyte; Luzon; Ryukyus; China Offensive. Decorations. Distinguished Unit Citations: New Britain, 16-31 Dec 1943; Philippine Islands, 24 Dec 1944. Philippine Presidential Unit Citation. Spatz Trophy, 1989.